It is estimated that Texas has the second highest tiger population in the world, behind only India. 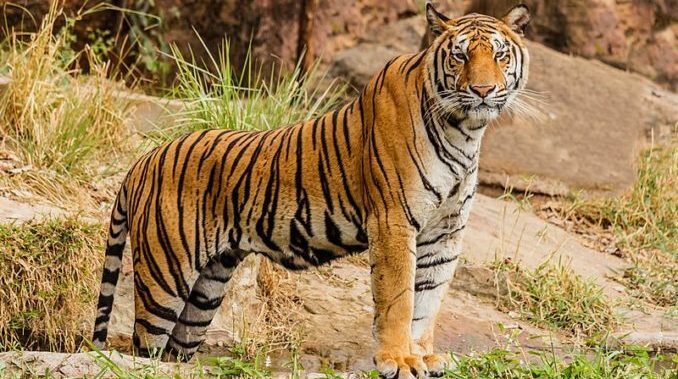 If one wants to see a tiger up close, there are a number of big cat rescues in the state (as well as zoos) where one can witness their majesty. Where one does not expect to see a tiger, though, is urban Houston. An unnamed individual went into an abandoned house in Houston, TX to indulge in marijuana. Instead of being abandoned, there was a tiger living in a small cage in the garage. The person called the police to report the strange sighting. At first police were skeptical, assuming the person had already had a head start on the drugs. The tiger, while confined to a four foot by eight foot cage secured with a screwdriver and nylon, appears to have been fed regularly and was in “good spirits.” Authorities are still unsure how the tiger came to be in the garage, or who had been feeding it. The giant kitty will be transported to Cleveland Armory Black Beauty Ranch, a wild animal sanctuary in Murchison, TX, to live out its days in relative freedom.